Move-In Ready 3 Bedroom 2 Bath 2 Car Garage nestled in highly desired Brentwood Hills! This neighborhood offers many amenities including a huge family pool, tennis courts, playgrounds, soccer fields, preschool/daycare, and much more. 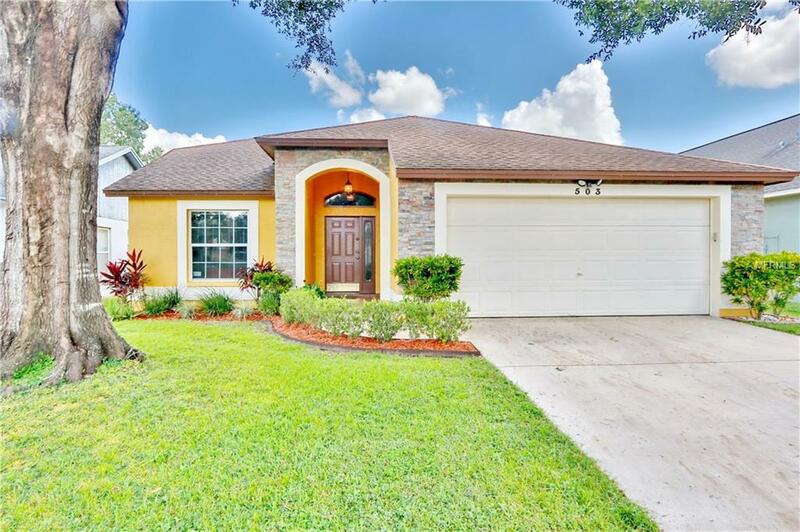 This home includes a huge master bedroom with brand new flooring and beautiful bathroom that features dual sinks, custom tile counter tops, tile floors, and updated shower. It also offers a separate sliding glass to the porch. The other bedrooms have great size and come with brand new flooring plus glass sliding doors for the closets. Kitchen is very inviting and offers great size with two different eating areas, lots of cabinet space, pantry as well as updated WHIRLPOOL appliances. Plus your indoor washer/dryer hookups. The porch is very huge, covered, screened in, and includes a hammock hookup to enjoy the spacious fenced in backyard. Once you arrive you can't miss the beautiful updated stones on the exterior. You get all of this with easy access to excellent schools, shopping, restaurants and everything else Brandon and Tampa Bay has to offer! Pet Restrictions Please Check With Hoa For Breed And Size Restrictions.